Wiyo at the high point on "Mesa Olvidada." Cabezon Peak is to the left. A moderate hike on public (BLM) land--about 4 miles as described here, with the high point on the hike about 460 feet above where you park. The reward for your efforts is views that go on for miles. The mesa you’ll be on is an unnamed outlier of Mesa Cocina; here I’ll refer to it as Mesa Olvidada (“Forgotten Mesa”), the name given to it by fellow hiker Wiyo. You can see a YouTube video of the hike by clicking here. From the Big I in Albuquerque, it’s an hour and a half drive to the trailhead. 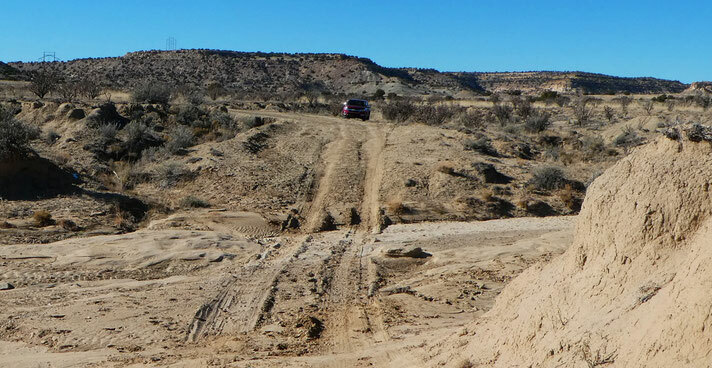 Beyond Tohajilee, the access road is unpaved and crosses arroyos and shale beds, so do not attempt this drive during or soon after wet weather. The final couple of miles of access road consist of a two-track in poor condition; do not attempt that part of the drive in anything but a high-clearance AWD or 4WD vehicle. From Albuquerque, drive west on I-40 and turn north at the Tohajiilee exit. At 35 deg. 5.812 min. N, 107.661 min. W, just before entering the school complex, turn right over a cattle guard and immediately turn left onto an unpaved road. Set your trip meter to zero. Stay on the main road (N-56) as it heads NNE, ignoring various turnoffs. Just after the route veers NNW, at roughly mile 3.0, the road forks at 35 deg. 8.457 min. N, 107 deg. 5.695 min. W. Bear right, staying on the main road. At roughly mile 6.8, you reach a T intersection (with street signs!) at 35 deg. 11.596 min. N, 107 deg. 6.228 min. W. Turn left (NNW). At roughly mile 8.9 you’ll cross a cattle guard in a fence, after which the road becomes little more than a two-track (and in places, barely that). If the final section of road is more than you can handle, consider doing the Mesita Blanca hike instead. But let’s assume that you bravely (or foolishly, depending on your vehicle) press on. At roughly mile 11.3, turn right (northeast) onto the two-track that begins at 35 deg. 14.732 min. N, 107 deg. 8.733 min. W. About 170 meters later, the two-track drops into and crosses the Cañada del Ojo. Depending on the weather and your vehicle, you can cross that arroyo and then pull off and park about 35 deg. 14.829 min. N, 107 deg. 8.481 min. W (6060 feet). Find and follow the faint two-track that extends NW from the parking spot. The crossing of the Cañada del Ojo. Wiyo opted to park his shiny new truck short of the crossing. Stay on the two-track as it follows a local, shallow, unnamed arroyo upstream, keeping to its west side. About 500 meters from the indicated parking spot, the local drainage bends slightly east of north and the two-track dwindles into a cow path that continues up the drainage. At 35 deg. 15.237 min. N, 107 deg. 8.607 min. W it’s time to leave the drainage bottom. There you’ll pick up the remnants of an old road, which I suspect was bulldozed during the 1950s uranium exploration boom and has been deteriorating ever since. In many places the road cuts have become arroyos, so the route is now impassable for wheeled vehicles of any kind. You can, however, walk along one edge of the road in the worst spots, and use it to get to the top of the mesa. At times you may doubt that there ever was a road, so I’ll provide extra waypoints. Once the road leaves the drainage bottom it heads to 35 deg. 15.394 min. N, 107 deg. 8.666 min. W and take a sharp left turn (to the SW). At 35 deg. 15.333 min N, 107 deg. 8.767 min. W, the road curves sharply back to the right. The road remnant then trends slightly east of north, just below and paralleling the ridgeline to the west. At 35 deg. 15.664 min. N, 107 deg. 8.646 min. W, the road tops out, and you’re free to roam about the top of the mesa. To do the four-mile version of the hike, strike out northward until you reach the north end of the mesa, at 35 deg. 15.768 min. N, 107 deg. 9.046 min. W (6500 feet), then head back. For a longer hike, explore along the rim of the mesa. If you do this, be aware that there’s a western spur of the mesa top that you can also visit. The old road formerly dropped off the main mesa top at 35 deg. 15.721 min. N, 107 deg. 8.718 min. W, onto a neck of land connecting the main mesa top and the western spur. Once you’re done on the mesa top, retrace your steps off the mesa and back to your vehicle. In this view from the hiking route, the Sandia Mountains are on the horizon at right of center.